New Day Planner Printables to Help You Plan Your Day. We’ve covered a lot of ground so far in this challenge. From choosing our focus areas to picking our top three daily must do daily items and tracking our progress. We’ve touched on the importance of building these foundation routines, and I talked about how there is no right or wrong time to start this. 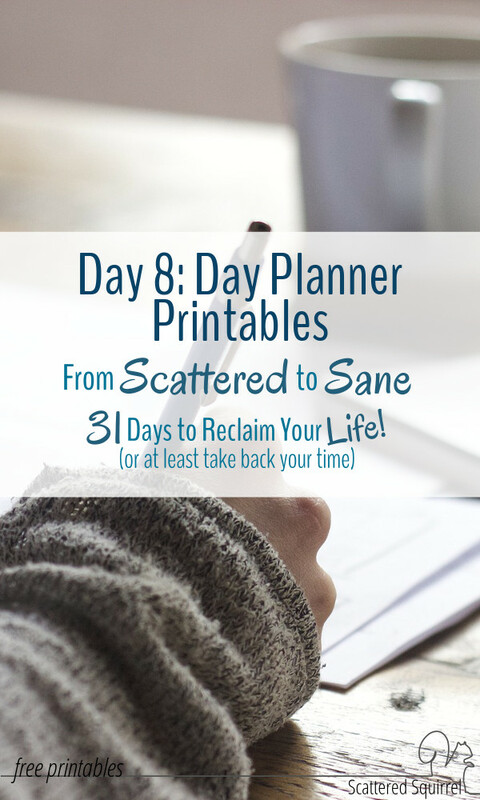 Yesterday I shared how you can use your planner to help you when you’re building new routines, so I thought it only fitting that today I share some new planner printables with you. 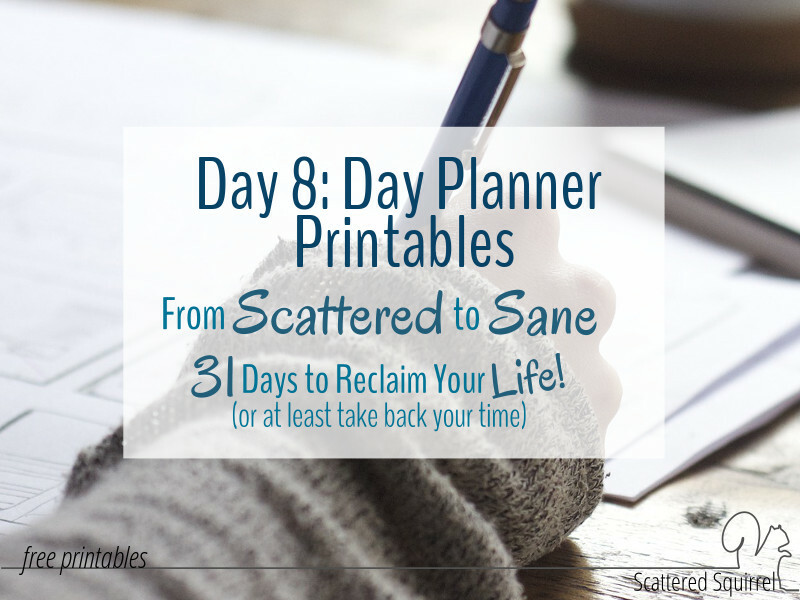 C’mon, you didn’t really think I could do a 31 Days series and not include some new planner printables did you? As I mentioned above we’ve already covered a lot of ground in the first week of the From Scattered to Sane series. I think it’s time we had a little fun don’t you? My husband deserves most of the credit for these planners since they were his idea. He knows I’ve been frustrated with my current planner set up and have been trying to figure out a good solution. He offered a suggestion for a layout he thought would work really well to balance my need for structure and my creative meanderings. I was so excites by his idea that I just couldn’t wait to sit down and make one. I was even more excited by the results that I couldn’t wait to share them with you. It had always been my intention to share some new planner printables during this series, just not these ones, but like I just said I couldn’t wait to share them. There are six different ones below because I decided to make them match the 2016 calendars. Ready to see them? 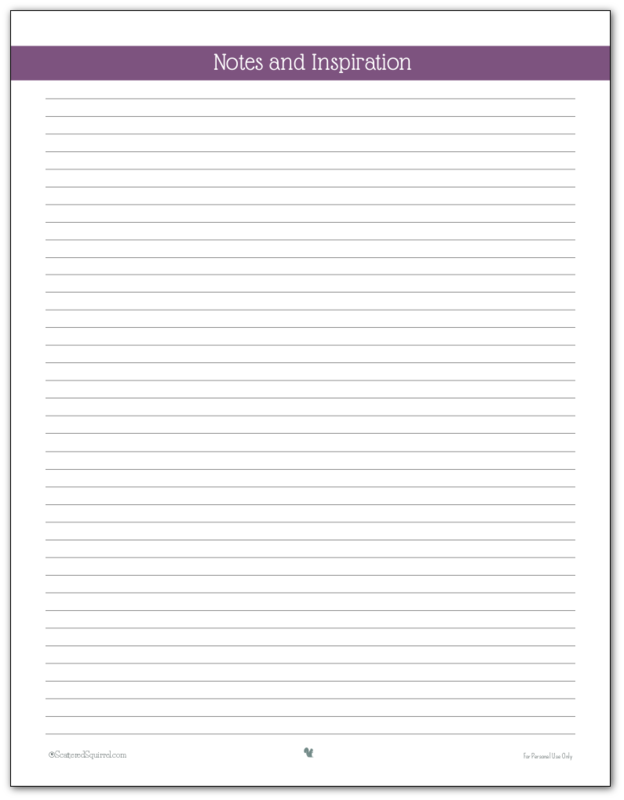 As with all the printables here on Scattered Squirrel, simply click the pic to grab a copy for yourself. And now one with the show! This half provides the structure. The next half provides the freedom for creativity. These ones really don’t need much of an explanation. They are intended to be used on the right hand side of the planner, making this a two page daily spread, I guess you could say. When your planner is open in front of you, you have the day planner on the left, the note on the right, allowing you to plan your day but still leave room for creative thought. 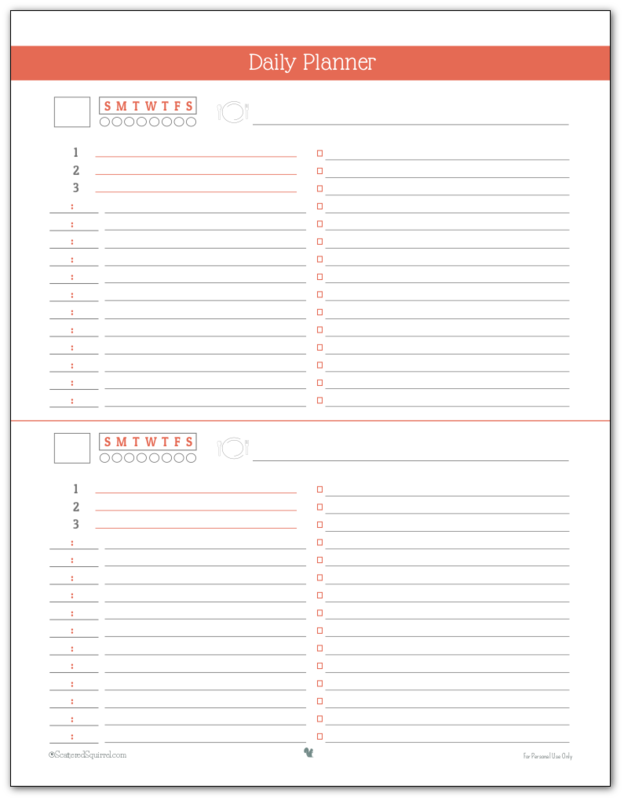 You could use the notes for longer to do lists, journaling, or even just on their own. I’m dying to hear what you think about these. For those of you who prefer half-size printables, don’t worry I haven’t forgotten about you. Those ones will be coming out tomorrow. I can’t wait to get those out either. So, until tomorrow I hope you all are still doing well on your journey to reclaiming your life and taking back your time. How are your daily three coming along? Are they getting easier? Don’t worry if they’re not, it takes time to build a routine. For now, scroll back up and pick your favourite and have some fun trying it out. And don’t forget to let me know what you think in the comments below. Enjoy the day planner printables everyone! Inspiration is spelled wrong on the second pages of planner. I’ve never heard of Hobonochi before, I had to go look it up. Looks like a neat little planner system. I see what you mean about the size, they are a little on the tiny side, at least for me they are. I’m only on day one of using mine, but I have to say, I’m really loving it so far. If you do decide to try them, I’d love to hear what you think about them.